Home » 09-10 Offseason » Will Roberto Alomar Get Into the Hall of Fame? Will Roberto Alomar Get Into the Hall of Fame? Today we will find out what players have been voted into the Baseball Hall of Fame, and among the candidates is former Met Roberto Alomar. Many consider Alomar to be the very best defensive second baseman in baseball history. That alone should get him into the HOF, but he also has offensive stats to support the argument. He finished his 17-year All-Star career with 2724 hits and an exact .300 average, as well as a .374 OBP and .814 OPS — pretty damn good numbers for any second baseman, but particularly impressive for one with his prowess in the field. He was an All-Star a dozen times and won 10 Gold Gloves. He should be a shoo-in for the Hall. But, he may not make it in this year. Mets fans — including myself — remember him more as one of the greatest busts in team history than as a future HOFer. The Mets traded half their farm system and Matt Lawton for his services during the winter immediately after the best offensive year of his career. Naturally, he responded by putting up the worst numbers of his career. It was the most astounding case of a team (the Indians) selling high. What the Mets didn’t know was that Alomar arrived as damaged goods — he had a back problem that nagged him at the end of 2001 but hid from the Indians. The hidden back issues, combined with the pressure of playing in New York, were too much for the 34-year-old (and rapidly aging) star. But before he arrived in Flushing, Alomar was indeed a star — hands-down, the best all-around second baseman of his generation. A few things, though, may keep him from being elected to the HOF this year. First of all, many writers purposely leave a first-year candidate off their ballot because they feel a “first-ballot Hall of Famer” is a status that should be reserved for only the very, very best players of all time. As great as Alomar was, the players that most closely compare to him include Lou Whitaker and Barry Larkin — both very good, sometimes great players, but nowhere near the level of, say, Willie Mays or Babe Ruth. Second, there is the spitting incident. Personally, the day that Roberto Alomar spit in the face of an umpire during a World Series, in front of a national TV audience, was the day I began hating Roberto Alomar. As you know I’m an old-school guy and to me it was one of the most disgraceful, abominable, and inexcusable incidents in MLB history — for so many reasons. So I was one of the fans who was unhappy with Alomar from the day the Mets acquired him, rather than after he proved to be a bust. But how many writers consider that incident when filling out their ballot? The qualifications for election as stated on the ballot include sportsmanship, integrity, character, and contributions to the game. That one incident displayed Alomar — in front of millions — as one who lacked all four attributes. But, time heals all wounds, it was one isolated incident, and even the umpire he spat on — Bill Hirschbeck — has forgiven Alomar and wishes him luck. More recently was the news from a former girlfriend claiming that Alomar had AIDS — a charge that Alomar vehemently denies. Whether it’s true or not shouldn’t matter, but who knows what goes through the minds of the individual voters? Finally there is the issue of him playing in the “steroid era”. Who knows who took what and when? Who knows if Alomar himself was “enhanced” by something other than hard work and Wheaties? 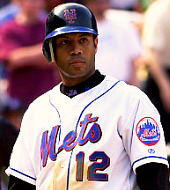 I did not like Alomar before he became a Met, and my dislike obviously grew as he stank up Shea Stadium. But I can’t say he doesn’t deserve to be in the Hall. My feeling, though, is that he won’t make it as a first-timer. We’ll find out for sure in a few hours. Interesting the notion of voting someone in on their first ballot only when they are absolutely, irrefutably nails. Prior to reading this post I had Alomar as a shoo-in this yr, but when you mention Mays and most recently Rickey Henderson who re-wrote the book on lead off hitting – then I can see why Alomar may have to wait. wonder if Dawson will make it this yr?I think he should even if his OBP is more Francouer-like. If you consider the criteria of being the best at his position in his era, he is a certain Hall of Famer. But each individual writer has their own criteria, so I think he won’t get in until next year. Speaking of criteria – there has been an interesting backlash to the Alomar-8-votes-short issue on ESPN where Buster Olney and Rob Neyer argue that many writers are too far away from the game to have a view. Exaggerating a little I’m sure but the point is made – how many of the ‘members’ really are tuned in to what is going on in baseball?